These two x-rays show an arthritic knee and a knee after it has had replacement surgery. In the arthritic knee the joint is malaligned with minimal space between the thigh and shin bone. These degenerate changes will cause pain and discomfort. 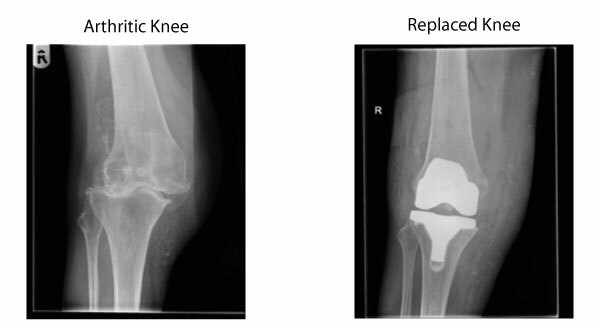 In the knee replacement x-ray you can see that the lower end of the thigh bone and the upper end of the shin bone have been replaced with the implant. The knee joint is now perfectly aligned.